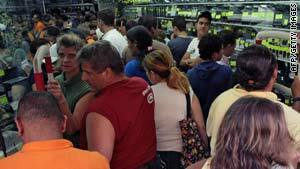 Venezuelans jam into an appliance store last weekend in anticipation of price hikes. (CNN) -- Venezuelan inspectors, aided by the military, shut down 70 stores Monday as a sanction for allegedly adjusting prices in the wake of a currency devaluation last week, the state-run Bolivarian News Agency reported, citing the inspection agency. Over the weekend, Venezuelan President Hugo Chavez threatened that he might expropriate businesses that raise prices following the steep devaluation. The Venezuelan bolivar currency, which had been fixed at 2.15 to the U.S. dollar since 2005, was devalued to 4.3 to the dollar. For food and medicine, Chavez announced a second fixed exchange rate for these "necessity" goods at 2.6 bolivares to the dollar. In all, the Institute for the Defense of People's Access to Goods and Services sanctioned 73 percent of the businesses it inspected Monday, the news agency reported. Among the businesses facing punishment are at least two megastores belonging to the Exito chain. The stores were ordered shut for 24 hours, the news agency reported. Once the stores reopen, they will be required to sell their products at last week's prices, before the devaluation was announced, state broadcaster VTV reported, citing a leader of inspection agency. "When we arrived at the establishment we observed an anomaly, as merchandise on the shelves was out of order," said Valentina Querales, national director of the agency. "Their story was that they were repositioning their inventory, but what they want here is to sell these old products at new prices." The inspectors were backed by national guardsmen, who were ordered to inspect stores by Chavez. "I want the national guard in the streets, with the people, to fight speculation," Chavez said Sunday, calling re-pricing a form of robbery. A devaluation makes foreign products relatively more expensive for domestic consumers, discouraging imports. Devaluation can also cause inflation, as demand for domestic products increases. The Chavez administration set up two tip lines for consumers to report what the government calls speculation by businesses.